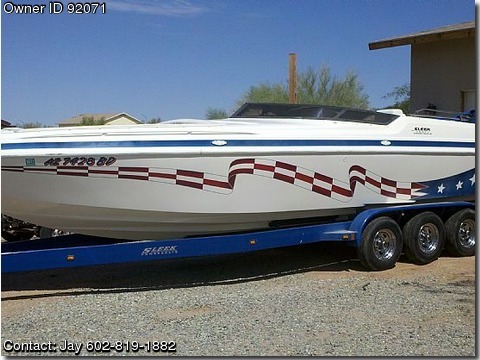 Call Boat Owner Jay 602-819-1882. Motor replaced 2006 with fuel injected. 2001 Sleekcraft SSB heritage open bow for sale. This boat has all the performance goodies on it, from the 750hp whipple supercharged 502 to the hydraulic offshore K-planes. It is Sleek's 30' model that is extremely popular on fresh water lakes as well as the open ocean. The mid cabin benches fold down for a spacious sleeping area with privacy curtains that snap in to place. The cockpit offers electric bolsters on both driver and passenger seats as well as comfortable seating for 3 on the rear bench. The engine hatch raises with hydraulic rams nearly vertical for easy access to the dual batteries or any maintenance needs. The stereo has been upgraded to 1500 watts, 2-12" subs,2-6"X9",&2-51/2"mids. Other electronics include a VHF ship to shore radio and GPS navigation. It also has a full bimini for the cockpit as well as mooring covers and boat cover. Out back there is a complete swim deck with retractable swim ladder and remote stereo controls and transom trim switch. It has thru hull exhaust that sounds beautiful, and an external water pickup that is filtered thru a sea strainer. The outdrive is a bravo 1 with XR uppers inside and a rebuilt lower with a 4 blade stainless prop. The motor was built buy Larry's marine out of Tucson who is very well known for his capabilities in high horse power applications. The motor was built in '06 with reliability in mind, all of the best stuff went into building it and will fire and run flawlessly every weekend. It and the outdrive have been serviced with royal purple synthetic their entire life and on a demanding schedule. I am interested in trading for a performance pontoon that is I/O triple tooned and at least 27' please only respond if your trade meets these criteria.